A little left-field but traditional style board games are the new rock and roll…Er, a bit of an exaggeration but they are ‘quite cool’ once again for a lot of people. 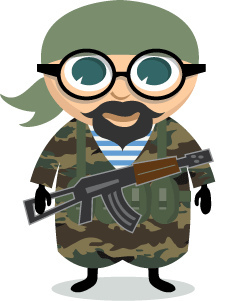 Now, on the occasions we cannot dress up as soldiers and run around the woods going ‘pew, pew’ it is nice to – dare I say – ‘socialise’ with the family. Now, this process needn’t be as painful as you might suppose and that’s where today’s boardgames come in. Forget Monopoly (and the family arguments that it results in) or that beige bag-o-monotony Scrabble – how about an evening of adventure, daring-dos and untimely sticky ends? 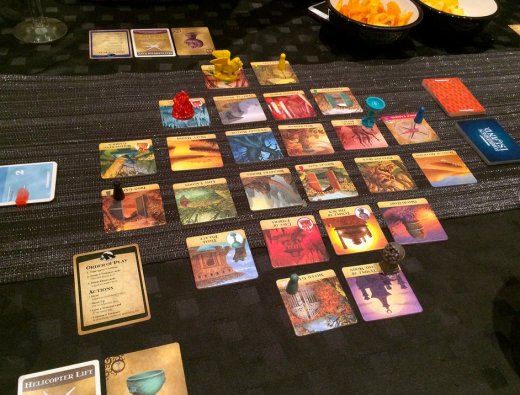 Every couple of Friday nights my family and I sit down to battle it out on the cardboard battlefield and this week we tried out Gamewright’s ‘Forbidden Island’ (duh, duh, duuuuuuuhhhh)! 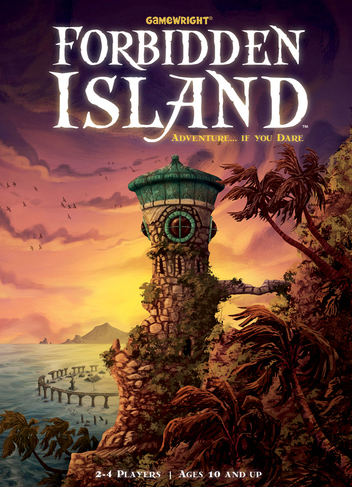 This is typical of the modern slew of board games that have been hitting the marketplace, it replaces tedious plods around a game-board circuit with a tense and imaginative adventure where you and your compatriots take on the roll of a cast-way roll (think TV’s ‘Lost’) on a mysterious island which – frankly – is out to kill you! This game is for 2 to 4 players with a age range of 10 and above – now at this point I say ‘hold on there’ because you saw ‘age 10 and above’ and were about to switch off weren’t you? A word to the wise, a group of adults drinking wine while playing a board game easily falls into the intellectual category of ‘age 10’, believe me I talk from experience. Overly complicated games and booze do not mix! Forbidden Island is just the right balance of simple game mechanics and intriguing game play and theme. The ‘plot’ is simple: You and your ‘Scooby Doo’ gang have landed on a mysterious island on the look-out for arcane treasure. To escape the island you must collect four mythical objects and get them back to your helicopter as a team. Simple enough? Oh well, did I mention that the island is sinking? Honestly, this is stupendous fun (it must be to warrant the use of the word ‘stupendous’)! For starters this is a co-op game – you are all on the same side (against the island) so none of that pain in the arse huffing like you get in Monopoly when someone get’s knocked out! And furthermore, because you are all in it together and each have a very particular specialist skill you have to co-ordinate as a team to complete the tasks in the most effective (and quickest) way! 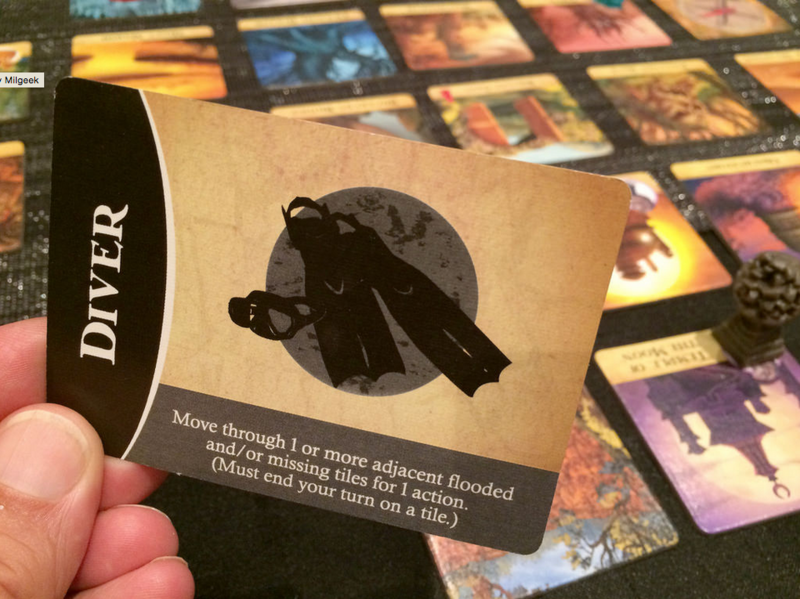 The Diver – one of the special characters in the game. You are allotted a character and this gives you some special skills – obviously mine was swimming, which is very handy on an island that is sinking! All through the game the water levels are rising and bits of the island become flooded and then, eventually, disappear altogether hampering your task. For such a simple game mechanic things start to get very, very tense as you all try to negotiate water obstacles to escape. Now, hopefully I have communicated the excitement of this game, but if not here is a – hopefully- the clincher. We lost our first game – the island sank just as we were about to recover the last mystical object and return it to the helicopter pad to make our escape. Despite this the whole group of us thoroughly enjoyed the adventure, every one of us was engaged in the storyline (even the wife, who famously ‘doesn’t get’ roll playing games) and several times during the course of the quest we were all on our feet pointing out ‘better ways’ to cooperate in order to finish in time. Whah, whah, whaaaaaaah! Game over! The island sank. It’s a cliche – but this game really brought us together. 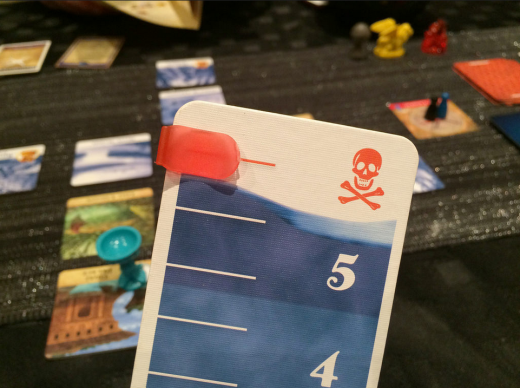 Forbidden Island is destined – I know – to become a firm ‘starter’ game (as it only takes up to an hour at most). It’ll really warm the group up before we undertake longer and more complex games, but even if that’s the only game you play in an evening I don’t think you will be disappointed. Buy it now!